Kendra from Catholic All Year came for a visit earlier this week. 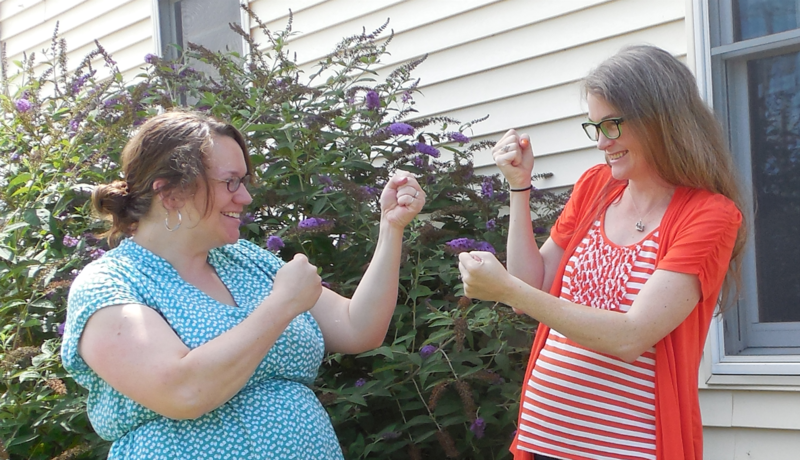 As you may know we had a massive blogger fight over the merits of the movie Silver Lining Playbook. 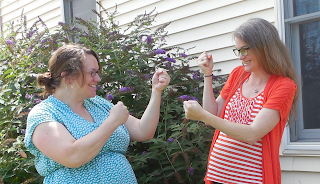 We agreed to duke it out in person but just as we were about to throw our first punches we looked at the 11 kids who were watching us and decided it would be a bad example to set: a pregnant woman beating on a postpartum woman and vice versa. For the sake of the kids we shook hands and agreed to disagree. See? Here we are: peaceful and happy to be positive role models. The day was so great. Kendra's kids were incredibly sweet, polite, mature, and just plain lovely. All our kids played really well together and I was so impressed to see how her older children so readily engaged with my kids. Kendra was the ultimate good blogger and got lots of great pictures. She was also really sweet - and hip! One of my favorite parts of the day was when I told her that her dangling bird earrings and lime green Buddy Holly glasses made her look so hip and she said her kids think she's a dork and don't believe her when she explains how cool she is. I was also a little embarrassed to learn that Kendra really is staying in Chicago. As a down-stater I am so used to people from the Chicago suburbs telling me that they're "from Chicago" when they are not that I just assumed she wasn't actually staying in Chicago... just near it. But Kendra, who I swore was some farmer's wife, Midwestern woman (judging by her header pic) is a 100% city girl. Look at all those kids! So happy and sweet. Now, folks, let me tell you that Kendra was also super generous. She brought us some meals and made a blanket for JP. It has has the crests / symbols for both of JP's namesakes. The lily and square for St. Joseph and the keys to the Kingdom and the upside down cross for St. Peter. Isn't it lovely? In the end, what I want to say is that I'm so glad Kendra came down from Chicago. I'm so glad she held my baby and relieved my aching back. I'm so glad our kids played together and we were able to visit. And I'm so glad that blogging has allowed me to become friends with interesting women I would have otherwise never met. Kendra and Kelly and all kinds of women I've never met... But if you're ever in my neck of the woods shoot me an email and maybe we can meet up, and if you ever see me mention that I'll be in your area let me know and maybe we can meet. I love this community that I'm a part of - of Catholic women who are smart, funny, and kind. That's so great. I just realized you might live near where I (and a couple other bloggers) will be August 17. Rebecca (The Road Home) and I are running a half marathon in Mahomet. Is that anywhere near you?? So fun. and oh my! I love that blanket. Gorgeous colors and patterns and I love the symbols on it. I never would have thought of that. I am a new reader of both yours and Kendra's blog and I didn't get to read very much about the whole Silver Linings Playbook thing but I'm so glad you got to meet each other and had a great time. What a beautiful group of children!! do you know what I love? i love that Catholic woman can have DIFFERENT opinions about 'on the fence' stuff and not end up being nasty. What a good witness! Happy day to you and your kids! This is the best thing I have read all week! I enjoy reading both your and Kendra's blog. I am glad you all had such a great time. Thanks for having us! I look forward to visiting and/or disagreeing with you again soon. I love reading about my blog friends getting together! I have had a couple of get togethers myself, and it is so nice to have a voice to match with the picture and blog! Looks like a fun time, but perhaps you could've at least arm wrestled??? I'm blog hopping tonight...something I rarely do (I'm a creature of habit), and found your blog. You are SO funny and I love your attitude!! So I was in your neck of the woods last November, did you see me? !, Ha ha. My gang was leaving East Peoria after visiting my SIL, drove through your area to visit my mom up in Peru, Il (LaSalle/Peru area). It was the day before Thanksgiving and I couldn't see your house. Not that I knew who you were or where you lived, but there was this TREMENDOUS fog that had blanketed the ground. I grew up in the Peoria diocese, moved to and taught in the Springfield diocese and then moved to Texas. You have beautiful children and I pray that you have a quick house sale and your little one has a fantastic school year! God bless!